TUCSON, Ariz. - Tucson Unified School District announced Wednesday that the Sabino High School girl's basketball team will forfeit nine games because it used an ineligible player. After the district conducted an internal investigation, it found the player was ruled ineligible because of a violation of a recruiting restriction dubbed "prior contact." TUSD says allegations that the program broke recruiting rules for two other players on the team were unsubstantiated. The Arizona Interscholastic Association staff will submit its recommendations regarding the investigation to the AIA executive board Feb. 19. The team remains eligible for postseason play. 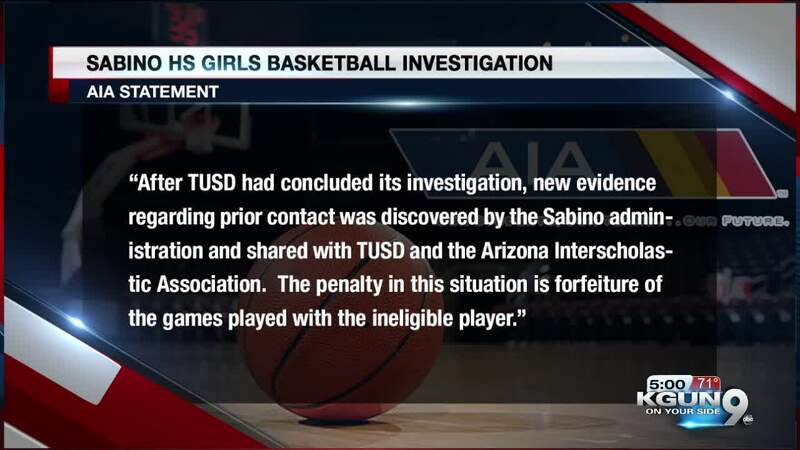 The Tucson Unified School District administration is conducting an internal investigation regarding the recruitment allegation involving the Sabino High School Girls Basketball team. Tucson Unified School District athletic director, Herman House, told KGUN9 the investigation involved three players. When the A.I.A. first learned about the possible violation, House said he was confident that the school acted in accordance with A.I.A. bylaws. "After TUSD had concluded its investigation, new evidence regarding prior contact was discovered by the Sabino administration and shared with TUSD and the Arizona Interscholastic Association. The penalty in this situation is forfeiture of the games played with the ineligible player." The latest recruiting violations follow a KGUN9 investigation of the Sabino baseball team that centered on recruiting violations, misuse of funds, and bullying.